It’s such a pleasure when an early contributor to this series returns with a new title. Today we’re rewinding to a guest from the first year of The Undercover Soundtrack. 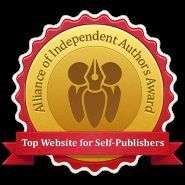 Dwight Okita was a finalist in the coveted Amazon Breakthrough Novel Award with The Prospect of My Arrival, a story that flirted with ideas of the supernatural and reincarnation. Now with his second novel, The Hope Store, he’s created a low-key magic realism/science fiction fable that centres around an invention that can bring happiness. Music was important for keeping him on message, and Dwight’s muses included U2 and my own favourite, Kate Bush. Drop by the Red Blog to hear more. 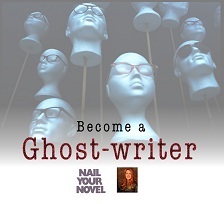 My guest this week had quite an epic journey to write her novel. It began with her experience of music as a graduate student, which made her want to write about the romantic and artistic relationship between a pianist and a conductor. She began to listen to more music to imagine the characters, imagining that within a few months she’d have it done, but the more she wrote, the more craft she realised she had to learn. This will be a familiar situation to all of us who’ve fallen for a story idea and then struggled to do it justice. Certain songs became talismans – Bob Dylan, Air Supply and the Rolling Stones – keeping her in contact with her original purpose and the characters who were so strong in her mind. Ten years on and her persistence has paid off: the novel is published by Blue Moon and has earned a prestigious award. She is Kris Faatz and she’s on the Red Blog with her Undercover Soundtrack. My guest this week has just published a collection of vignettes. They’re linked by a sense of time passing, anniversaries both happy and sad, and nostalgia. Music was the way to capture and preserve the essential moments and personal memories she wanted to examine, so the soundtrack was a soundtrack to her life too. She is Theresa Milstein and she’s on the Red Blog now. My guest this week is a musician as much as a writer – she teaches piano, and she says that playing is the closest she ever gets to a state of mindfulness. Her debut novel was sparked by the uncanny conjunction of a magazine article and a piece of music. The former was a piece about a couple who had signed up to have their bodies cryonically preserved after their deaths, in the hope that they would be reawakened and reuinited. And the latter? A haunting, icy piece of music by Ennio Morricone that seemed to urge her to write a story about a couple who sign up for preservation, and the tragic situation that ensues. Drop by the Red Blog for the Undercover Soundtrack of Andrea Darby, and her novel The Husband Who Refused To Die. I settled down to read this week’s Undercover Soundtrack contribution and what did I find? The writer seemed to have plundered some of my own favourite tracks. Massive Attack’s Unfinished Sympathy. The Verve’s Bittersweet Symphony. Kate Bush’s Cloudbusting (though if you’re as much of a Kate Bush nut as I am you could be forgiven for thinking I was going to make an orchestral hat trick with Symphony in Blue). Not only has my guest served up a stirring soundtrack, she’s also made big waves with the novel she’s showcasing – securing a position on the shortlist of the Guardian’s Not The Booker prize. She says music is the emotional heart of the novel, speaking of relationships, times, hope, love and validation. 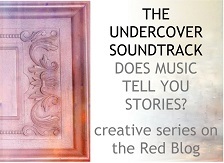 Drop by the Red Blog for the Undercover Soundtrack of Deborah Andrews and Walking The Lights. Yes, despite the cover change, the blog is still resolutely red. My guest this week has a novel about a woman who has kept her past identity hidden. The novel is its reckoning, of course, and its author had a challenge in evoking the many colours of her protagonist’s progress from child to woman. So she built herself a soundtrack. It’s a mix of radio theme tunes from her own childhood (possibly the first appearance in the series of Listen With Mother), traditional songs that conjure a powerful sense of place and melancholy reminders of the emotional rollercoaster of adolescence. Drop in on the Red Blog to meet Anne Goodwin and her Undercover Soundtrack. Who changes in the course of a novel? We hope the characters do. Sometimes the author does too. My guest this week feels that writing her novel became an act of emotional honesty that left her in a new place. Music was a constant companion – a mix of Bruce Springsteen, Pink Floyd and Parisian-themed works too. She is novelist, short story writer and award-winning book blogger Isabel Costello and she’s on the Red Blog with the Undercover Soundtrack for Paris Mon Amour. My guest this week says he is much concerned with reinvention. He’s spent his life setting himself challenges to embrace new careers, lifestyles, places to live – and the latest of those reinventions is being a novelist. His debut title is a story of 1970s Glasgow and required some daring imaginative reinventions – not least, writing in the voice and psyche of a 22-year-old woman. A soundtrack was essential – Tangerine Dream to soothe and order the brain; Pink Floyd, Bob Dylan and David Bowie to restart the period – and provide other wisdom besides. He is Glyn Harper – writing as GD Harper – and he’s on the Red Blog with his Undercover Soundtrack. Hands up if you know who Delia Derbyshire is. Don’t put them down yet. Keep them up, waft them gently and imagine you are conjuring a shimmering singing sound. That’s how you play a theremin, one of the first electronic musical instruments. Theremins are an abiding inspiration for my guest this week; her novel centres on the life and loves of a cellist who becomes famous in the 1920s and 30s for playing this eerie, theatrical device. Her soundtrack is an ethereal mix of Portishead, PJ Harvey, David Bowie, the classical cellist Yo-Yo Ma, and of course Ms Derbyshire, one of the pioneers of the BBC Radiophonic Workshop in the 1960s. And I also must mention that the novel (The Life and Loves of Lena Gaunt) has been nominated for several awards. She is Tracy Farr and she’s on the Red Blog with her Undercover Soundtrack.